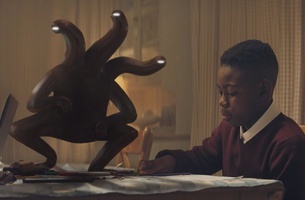 Great Guns’ Duncan Christie directs a powerful new campaign, ‘Family Monsters’, for the charity, Family Action. The film compellingly combines live-action and animation to create awareness of the breadth of family problems that the charity helps people to deal with. Creatively devised by And Rising, the quietly gripping 90-second film shows families living with a physical manifestation of their problems: a dark and ever-present monster. These shadowy, animated beings observe silently as each family struggles with isolating issues such as post-natal depression, poverty, alcoholism, and communication breakdown. The team avoided horror film territory when conceptualising the monsters – opting for neither a threatening nor cute characterisation, but rather an unwanted presence that weighs the families down. The monsters were imbued with different personalities, with BlindPig designing their anatomy and movements to loosely represent the problem in each scene. ‘Family Monsters’ is now online and in Picturehouse Cinemas across the UK.